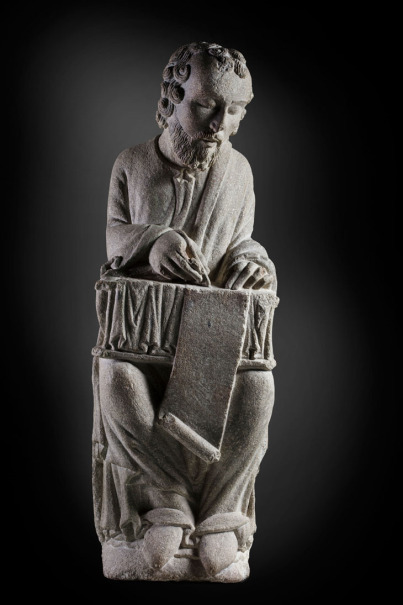 The Museo del Prado, the Real Academia Gallega de Bellas Artes and the Fundación Catedral de Santiago are the joint organisers of this monographic exhibition of works by Master Mateo for the cathedral of Santiago de Compostela, offering visitors an in-depth focus on a golden period in the history of the building, spanning the years 1168 to 1211. 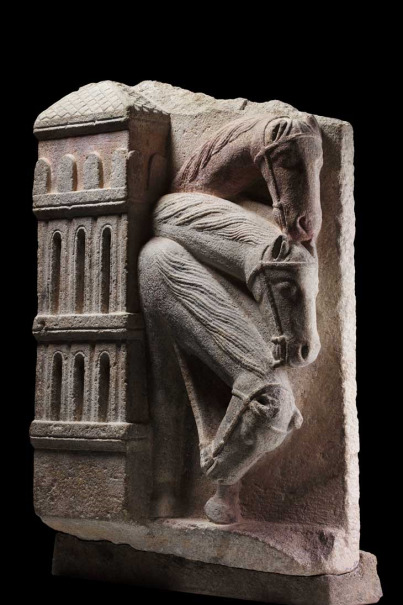 The exhibition features the nine known sculptures that have survived from the lost façade of the Portico of Glory, including a recently rediscovered one; other elements that were also part of that façade, including a rose window and two keystones; and elements such as the sculptures of Saint Matthew and Horses from the Retinue of the Three Kings which are fundamental for understanding the stone choir that occupied for first four sections of the nave until the 17th century. 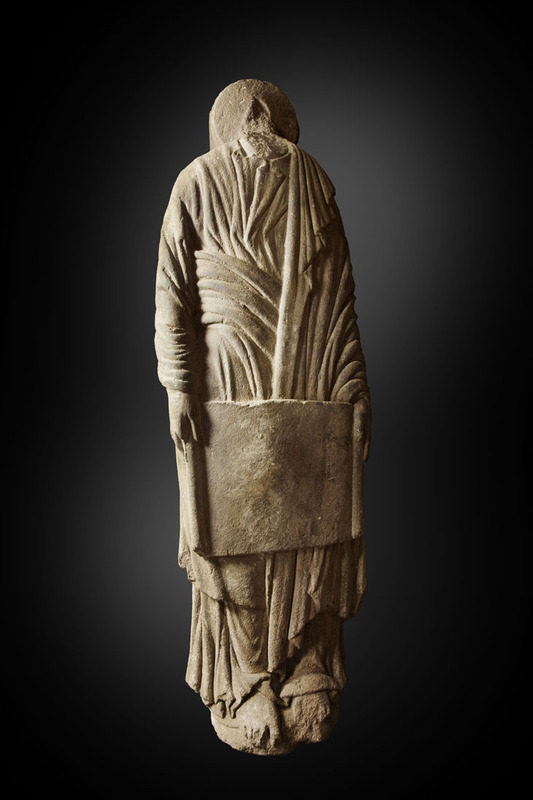 In total, the exhibition includes fourteen works which have been brought together for the first time in almost 500 years and have left their habitual locations for the first time in order to offer a new and complete account at the Museo del Prado of the work of Master Mateo and his workshop over more than four decades at the cathedral of Santiago de Compostela. This was a period when the building underwent a profound artistic and theological transformation. Master Mateo retained the previous work undertaken during the bishopric of Diego Gelmírez, when considerable advances were made on the cathedral’s construction between the years 1101 and 1140, including the dedication of the ambulatory altars and the high altar, the construction of the crossing façades (Platerías Doorway and Paradise Doorway) and the start of work on the cathedral’s nave. Mateo then embarked on the completion of the building at a date no later than 1168, the year he was granted a lifetime pension by Ferdinand II of León in a document on display in the exhibition. Master Mateo and his workshop carried out significant work in three important areas of the cathedral: the so-called “crypt”; the Portico of Glory; and the lost west façade. He was also responsible for the stone choir that was installed in the first four sections of the nave. The “crypt” or “old cathedral” was built to correct the difference of level between the cathedral’s nave and aisles and the Plaza del Obradoiro. 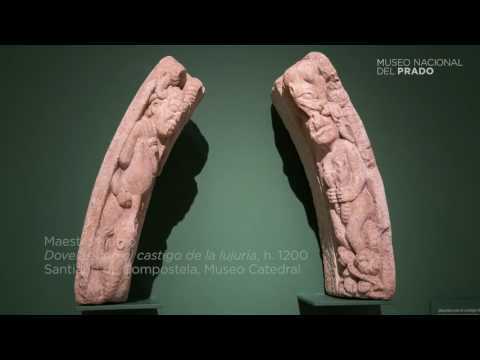 It also functioned to support the Portico, with which it shares numerous formal and particularly iconographic features, introducing new artistic forms into the Iberian Peninsula that combine French, Italian and even Islamic influences. The most significant part of Master Mateo’s project was the Portico of Glory, one of the masterpieces of European art of the late 12th and early 13th centuries. 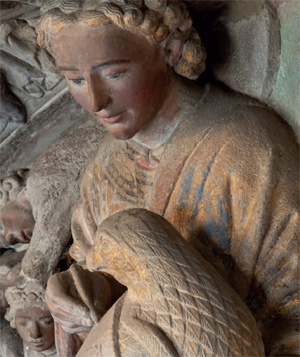 Carved on the lintels set in place on 1 April 1188 is the statement that Master Mateo had directed work on the cathedral “from its foundations”. The Portico is currently the subject of a restoration project to recover its abundant polychromy and to resolve various conservation issues. Master Mateo originally executed a complex façade for the Portico that was altered in the mid-16th century and replaced in the 18th century by the present façade which gives onto the Obradoiro. 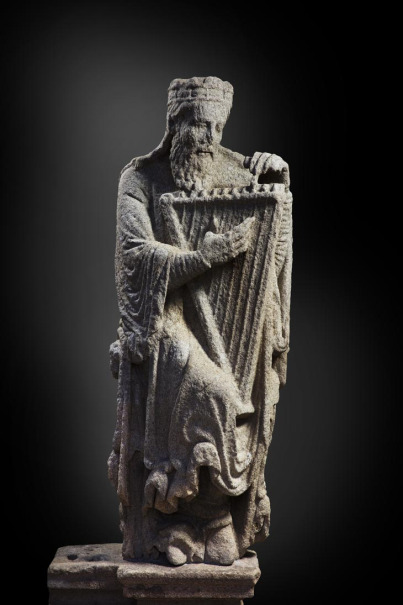 Work by this master also included the construction of the stone choir that was installed in the first four sections of the cathedral’s nave but was replaced in the early 17th century by a wooden one. These elements were closely interrelated and together their complex iconography functioned to transmit an apocalyptic and redemptive message. 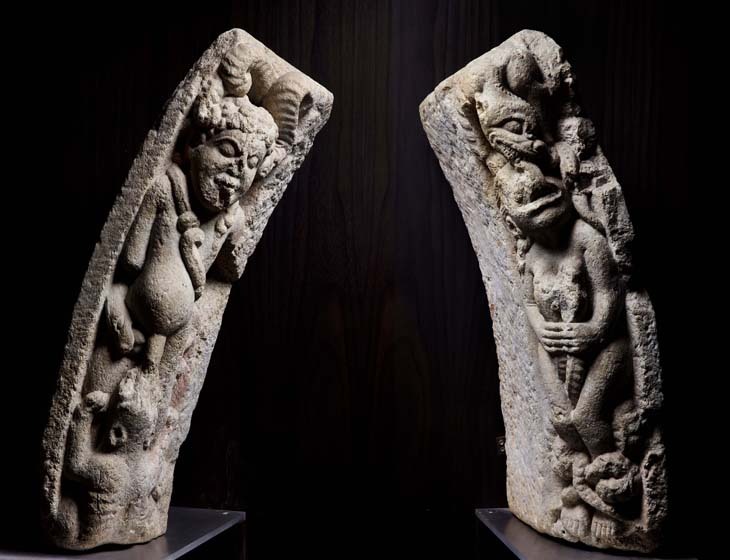 A number of sculptures from those demolished elements were reinstalled inside the cathedral, sent to different institutions or entered private collections. The present exhibition includes fourteen works, opening with the document in which Ferdinand II grants a lifetime pension to Mateo Mateo, a text that constitutes the first reference to his activities at the cathedral. Horses from the Retinue of the Three Kings - reused as infill material for the Obradoiro staircase and recovered in 1978 still with traces of its original polychromy – and Saint Matthew came from the retro-choir and exterior façades, respectively, of the granite choir constructed by Mateo and his workshop around the year 1200. 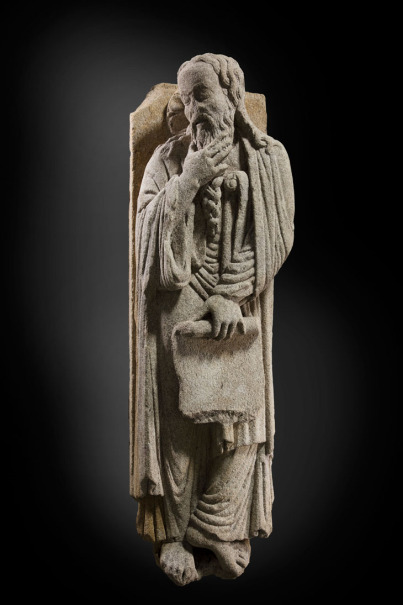 The other works on display are from the lost west façade, including the sculptures of David and Solomon which, following the dismantling of that façade, were reinstalled on the parapet of the Obradoiro loggia where they remained until they were recently restored on site prior to their inclusion in this exhibition; and the Statue-column of a male figure with a cartouche, a damaged figure that was rediscovered this October inside the cathedral’s bell tower where it had been used as infill material and is now being presented to the public for the first time. Also on display are other architectural elements that were part of the façade such as the large Rose window which crowned the central doorway and was reconstructed from fragments found in 1961; and two Keystones with the punishment of Lust, possibly from the arch on the south side, which had the same iconographic theme as the corresponding arch of the Portico of Glory, devoted to the Last Judgment. 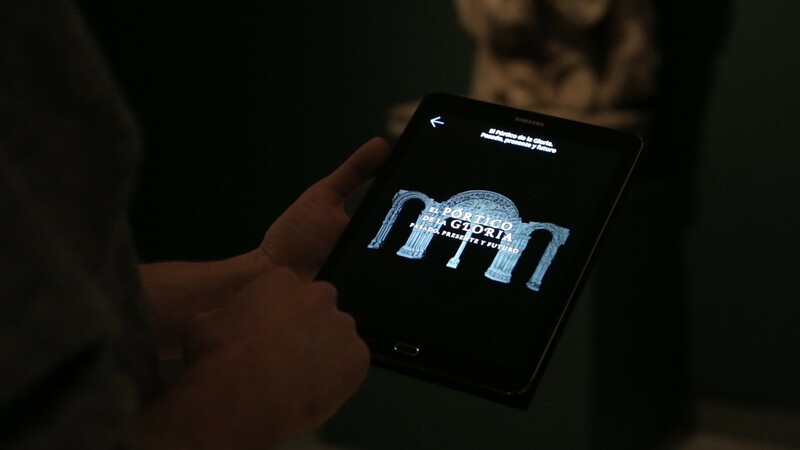 The support of Samsung, a Protector Member of the Museo del Prado, as the technological collaborator on this exhibition means that visitors can enjoy free use of tablets with content that provides context on the works through an app available in the gallery. This app allows visitors to make a virtual tour of the Portico of Glory and the cathedral’s original stone choir through audio-visuals made available by the Fundación Barrié. 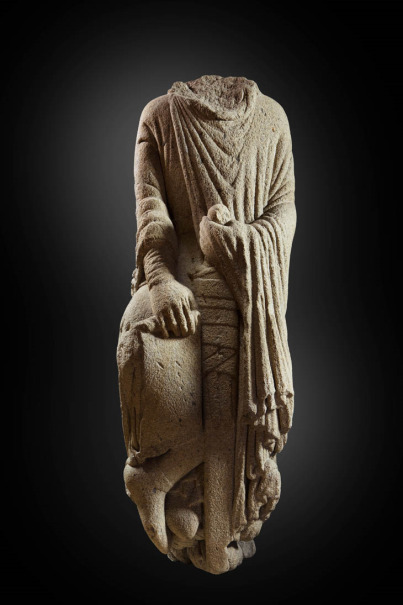 The app also includes commentary on Master Mateo and the construction and architectural evolution of the cathedral from its origins in the year 820 to its completion in 1211, the year it was consecrated.